The "Federal Research Station for Fruit, Wine and Horticulture" in the city of the same name on Lake Zurich in the Swiss canton Zurich was founded in 1890. The main event was through phylloxera and mildew in the second half of the 19th century caused huge damage in viticulture. Today, she is primarily responsible for German-speaking Switzerland. The Institute also manages some vineyards on Lake Zurich. The first director of the institute was Professor DDr. Hermann Müller-Thurgau (1850-1927), who here in Geisenheim (Rheingau) begun work on the new breed named after him Müller-Thurgau finished. The main tasks are consulting, training and research and development. The well-known biologist Dr. Otto Schneider-Orelli (1880-1965) was involved in the study of plant physiological, entomological (insect) and mycological (fungi) problems at the beginning of the 20th century. In 1981, Professor Hans Tanner in collaboration with Carla Zanier, the chemical compound trichloroanisole (TCA) for the first time as the cause of the corked identified. In the Beverage Microbiology working group, pure yeasts have been selected for vinification since the 1970s. Particularly successful yeasts are Lalvin W15 and Lalvin W27. Other focal points are the use of beneficials in the vineyard as well as controlling pests by the disrupter, A similar institute responsible for Italian and French speaking Switzerland is Changins in the canton of Vaud. 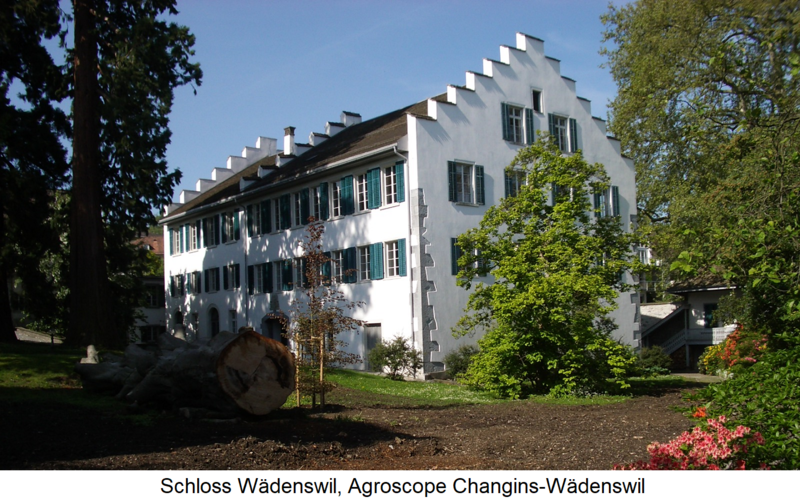 The two stations were in early 2006 under the administration of Agroscope Changins-Wädenswil summarized. This page was last modified at 26 March 2019 at 17:28.